Light grey, medium length plain faux fur cushions or pillow covers. Perfect for both bedroom or chair and sofas. Can be used independently or combine with the darker grey Badger faux fur cushions. A mid to dark grey faux fur cushions or covers only, medium plain length fur. Zipped along one edge. A versatile colour for many environments. A rich dark brown faux fur, plain and medium length but dense and very soft. 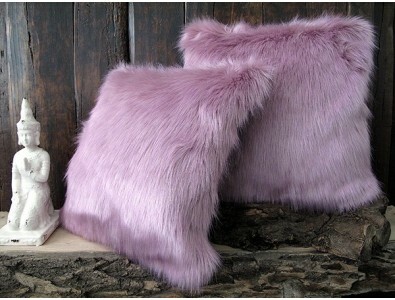 These modestly priced faux fur cushions will add that touch of luxury to any room. Shiny black medium length fur, plain and economically priced. Good all round cushions or covers for lounge or bedroom. A plain cream, medium length faux fur cushion. Easy aftercare, suitable for many interiors where a light plain fur is needed. Economically priced. 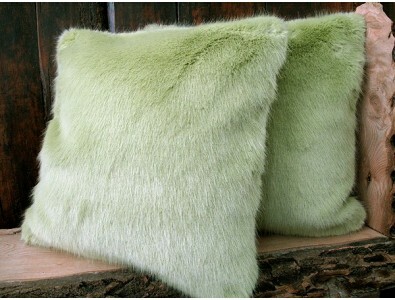 The Spring Willow design is a beautiful medium length plain fur and perfect for our faux fur cushions and covers. A very dense and soft faux fur fabric. It is a soft pale green colour. Pure luxury and quality. A white faux fur is used to produce these gorgeous and striking faux fur cushions and covers. Plain and medium in length, easy to maintain.